What I learned in last year. Today is my birthday. In 2012 on 15th January I decided to start writing. Since I started doing that, lots of positive changes have surrounded me. The following blog is about what I learned between 15th January, 2012 till today – the same day of 2013. I am sure you have your own list every year. Following is the list I have of all the lessons I learned last year, hope you find it interesting. Follow your instincts. Your curiosity n instincts will lead u to greater achievements. Separation from a person will only make you understand and help you realize how well you are really connected with them. May put any sort of relationship to a test. Whether it is your life partner or a friend. Realization is the first step in any transformation process. Until you do not realize that change is needed or wishful, the transformation for good or bad will not commence. Breads and almonds will start burning while toasting, right when you take your eyes off them. Luck plays a major role in your progress. If it is meant for you nothing or no one in the world can stop you from achieving it. If it is not meant for you nothing or no one in the world can help you get it. Nothing is impossible for you if you decide to do it. And mean it. Everybody gets 24 hours in a day. You can make it feel like 2 hours or 200 hours. It is entirely up to you. Whether you compose music; publish a book; get that big break in your acting career – everyone you expect may not be as interested as you thought. Just accept it and learn to go with it. Your daily horoscope is not always correct, but if you find something positive written there. Convince your brains to believe it’s true. It will help you big time to live the day positively and happily. Co-incidences may have something in common, may b a sign. Last year on 15th January 2012, I decided to do something with my life that may help others, I decided to start writing something inspiring and positive and started a blog. 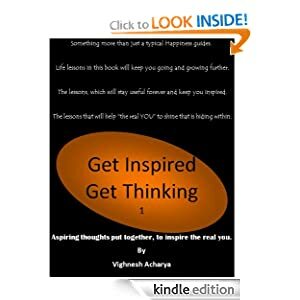 That led me to publish a similar self-help book “Get Inspired Get Thinking”. This year, I got a picture of (Indian) Goddess Saraswati, let’s say she is the Indian version of Muse. Today I read my sign. Ask your close friends who are reliable to give an honest feedback about your performance at new venture, ask them for suggestion. My best friend was very honest about my writing. That led me to studying writing techniques. I have stopped writing for a bit, but I have to admit, while I am busy studying writing techniques, I am already feeling more confident about writing better next time when I sit down continuing the inspiring fictions I am in the middle of. The way you use your Facebook or twitter and your access to internet in your free time – it all together will affect your thinking and your behaviour accordingly and vice versa. Always try to see the other side of the story. Listen to others before judging the situation. Disasters can strike anywhere any time. This world didn’t come to an end on 21st December, but if you had your eyes wide open and yourself awake, you may have noticed that crime and other crimes which looks like an accident are increasing. Human race is ashamed and scared to some point – that my friend is almost similar to the end of the world. It is the end of the world, if you cannot go places and do what you feel like in the moment, considering your safety and keeping it in the core of everything you do, no matter where you are. Yes, I am referring to things like gang rapes, body parts of a person found scattered around in the park, some weirdo killing people in a theatre or even school kids to cross the limits. Rely on God and your prayers a bit more. It will only help you gather all the positive energy around you that randomly floats in the Universe, which no one else wants to claim. If you do not believe in God, That God you can find even in a rock. Because we are people, we see God in a similar body form. (Who knows, may be a Dog sees God on four legs. Did you know? “There are some Dogs who think we are Gods”). But with all the faith and devotion and prayers, you can have a rock or even a pebble turn into something omniscient. It is all about how much faith you have to show. You get what you give. I never cared to leave a review of the book I just read or the game I just played on the website I bought it through. My e-book was downloaded more than 700 times roughly (including free promotion days), but I only received 1 review. So many of my friends told me they liked the book, but I did not get any review that will help the sales. That time I realized how important each review can be. It hurt me not having review, good or bad (because even a bad review helps you realize what improvement is needed in your work), about my book. Now, I am eager to hear from even one more reader comparing the number of downloads to the number of reviews. I am now making sure to leave review of anything i experience. New Year resolutions, birthday resolutions – they all sound cool. But you do not have to wait for such special day to start making changes for good. It can be today or tomorrow. You may decide on 22nd March, to start making positive changes in your lifestyle for healthy living and may achieve such amazing results, by next year that 22nd March may become a very important day for you for rest of your life. No matter how small you think your job is, it is the way you do it will make the difference. No matter what you do, make sure you do it so good; no one else can ever replace you. You don’t have to be satisfied financially only with what you do as a job. If there is a job you know out there, doing which you will feel peaceful and happy grab it without thinking of the money. It will give you more happiness than the one that will pay you more money and you do not like. Having a blog mascot is a lot of work. Lol… if you have him and your followers like it, make sure they get a lot of it. If you cannot commit to that, don’t introduce one at first place. That’s for you, speedy sparks. If it makes you feel good, do it. No matter what it is, you do it because it makes you feel good. Doing what makes you feel good, will help you bring “the real you” out in front of the world. You will be more loved that way. The day I stopped drinking milk - an inspiring story. Speedy Sparks is here. Now! Like or Dislike, Just say it. High Spirits - Where is all the excitement?